Bring to boil then lower to simmer 20-30 minutes until the beans are tender. Drain & discard the vegetables. In a bowl combine the beans, tomatoes, onion, cucumber. Combine the oil & vinegar then toss with the salad. Let stand 10-15 minutes to let the flavors come together. Recheck your seasonings (taste it) and adjust. Picnic perfect! 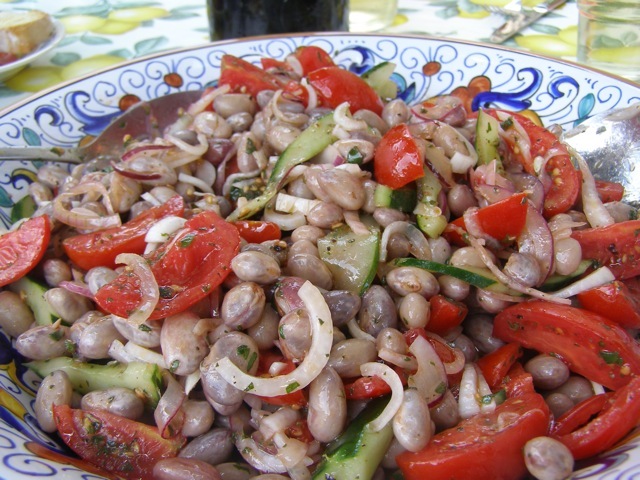 A garden salad with fresh borlotti or cranberry beans, cherry tomatoes and cucumbers goes great with everything from fish to grilled meats or eaten by itself with toasty bread & a wedge of pecorino (sheep's milk cheese).